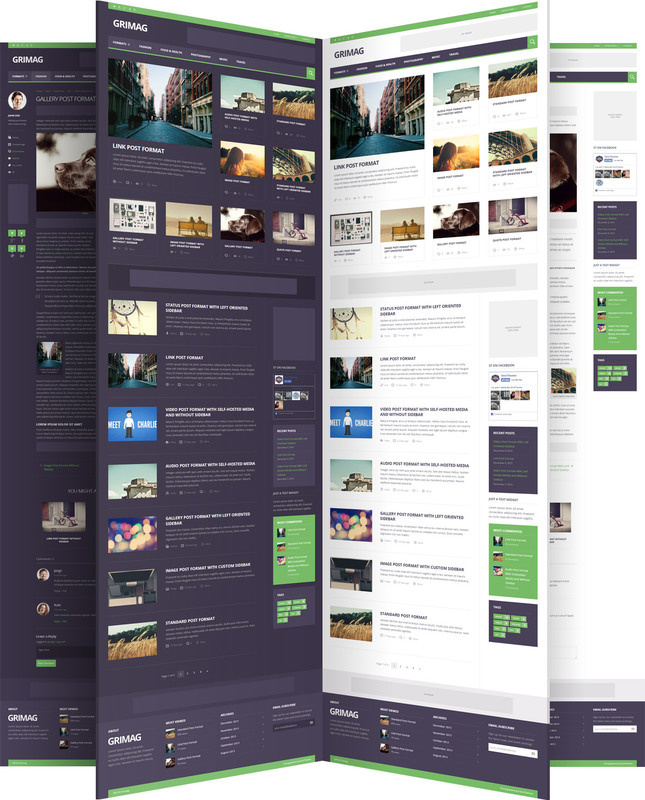 The Grimag WordPress theme by StrictThemes is designed with a content-driven approach to monetization in mind. Responsive AdSense ad units, which ensure that AdSense advertisements always conform to screen sizes, are a standout feature in this theme. Ad spaces are placed throughout the theme in ideal locations to generate maximum revenue without interrupting user experience or the flow of the site. Grimag boasts an elegant, modern design by default, with a lot of flexibility and room for customization. 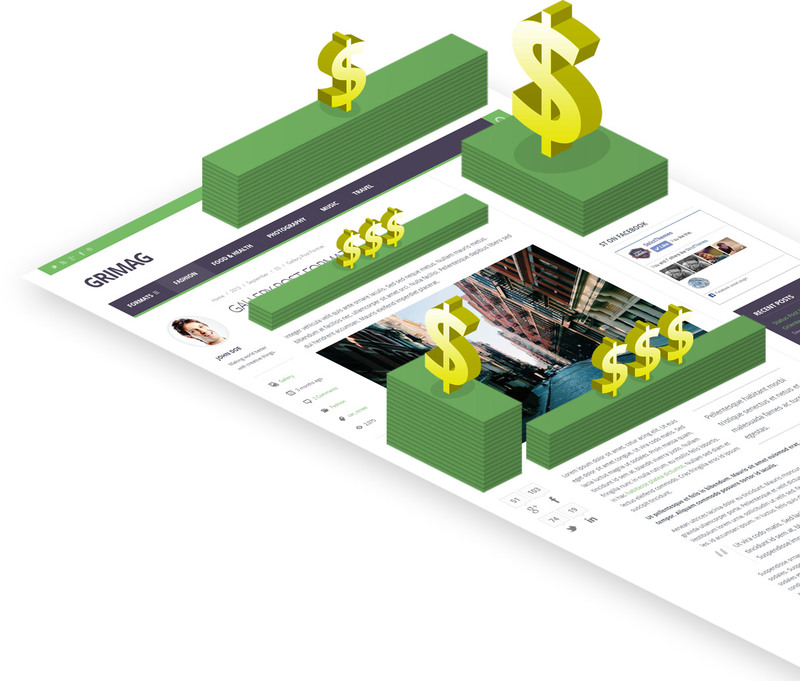 Grimag combines style and usability with an emphasis on ads and the potential for generating income from multiple streams throughout the site. Add beautifully styled forums to your site using the compatible bbPress plugin to create a space for visitors to discuss content, share information, and generate engagement. The Grimag theme is built to perform beautifully across all screen sizes and devices. It is a fully responsive theme that is really optimized for both display and usability on mobile devices. The theme is also HiDPI and Retina Ready and includes high-resolution graphics designed to look great on retina screens. Design-wise, Grimag comes with two default skins: light and dark. You can create your own custom color schemes easily by choosing colors from an unlimited palette using the theme options color-picker. The theme is compatible with the Google fonts library, giving you access to over 600 fonts for use on your site. The StrictThemes ST Kit Framework provides an intuitive theme options Admin area where you can easily change fonts, colors, branding information, and much more. The ability to create unlimited sidebars and the inclusion of custom widgets within Grimag offers a lot of flexibility and freedom for developing a unique site using this theme. Add custom sidebars to any post, page, or project to drive traffic to specific content or encourage visitors to take action. Grimag utilized highly-flexible widgetized sidebars as a vehicle to build out your site in a modular, customizable way. By default, the primary sidebar comes at a width of 300px on all pages. You can activate this site wide by checking the “Misc” page box in the theme options panel. Seven different footer sidebar options are available, giving you a lot of options for customizing the theme footer. Easily populate the footer with links, contact info, or sign-up forms using widgets. Grimag is fully compatible with the BuddyPress and bbPress plugins, making it easy to create stylish forums and groups, as well as manage memberships. For those looking to monetize their sites, forums are a great way to provide additional value to visitors and create engagement surrounding your content. Custom widgets included with Grimag’s ST Kit Framework are Get in Touch, Posts, Flickr, and Subscribe. A robust collection of shortcodes make customizing Grimag even more feasible. 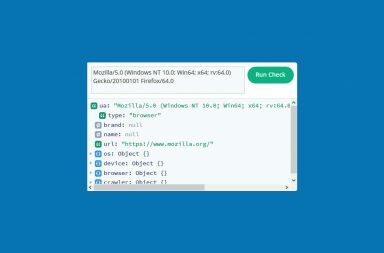 Add columns, buttons, and tabs on the fly using shortcodes. Over 100 unique, pixel-perfect glyph icons are included in the ST Kit Framework. Built-in social media icons are included with the theme, making it very easy to connect to networks and allow people to share your content. Connect to Twitter, Facebook, RSS, Google Plus, and more directly from your theme options area. Grimag is 100% translation-ready. The theme comes with a .po file containing all of the text strings. Custom meta boxes on posts and pages allow you to control options for each post and page. Custom CSS can be added to Grimag directly from within the admin panel without accessing the Editor or editing core files. Custom styles added in the admin area will be preserved during theme updates, in some cases eliminating the need for child themes. Thorough theme documentation accompanies Grimag, as well, which you can refer to for further insight. Grimag was built with SEO best practices in mind, and it Google Analytics ready. StrictThemes offers free bug fixes for Grimag. If you find a bug, simply contact the developer to report it and they will work with you to devise a solution. You can also expect updates to Grimag to be compatible with the latest versions of WordPress, so you shouldn’t need to worry about any downtime with this theme. Grimag also offers one-click updates directly from within the Admin area, so you don’t have to download and reinstall the theme each time. That’s a handy feature that you don’t always get with premium themes! 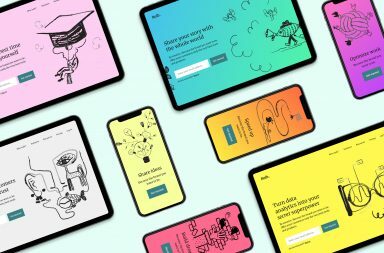 When it comes to setting up your theme, the ST Kit Framework includes a simple one-click installation and a Setup Wizard to walk you through the process, step-by-step. For users new to WordPress, this is a great feature. It makes getting your website up and running extremely quick and easy. 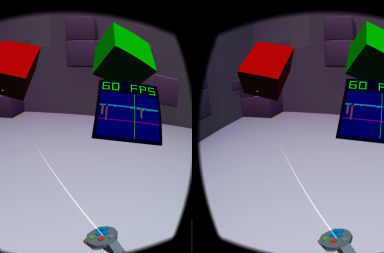 Optional demo content is included with the theme, so if you want to build on the theme demo as a starting point you will be able to do that. If not, of course, you can always start from scratch. 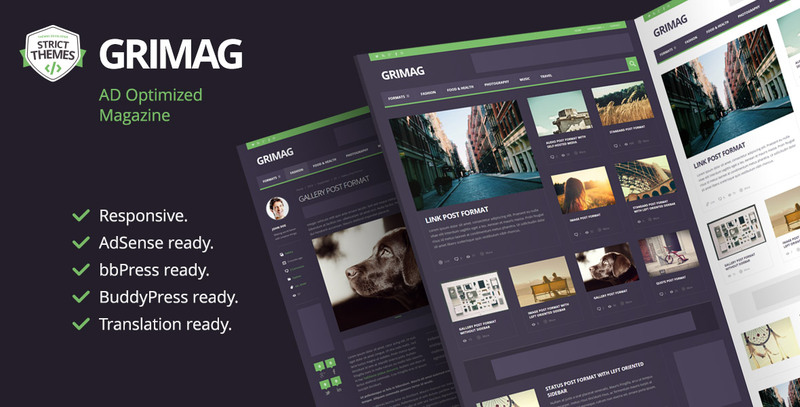 Grimag is an awesome theme for anyone looking to monetize a content-driven website. Designed for maximum earnings, Grimag manages to handle ad units strategically in a way that doesn’t compromise user experience. The ability to integrate bbPress and BuddyPress into the theme extends its potential ever further, and adds a lot of value to the theme. Modern layout and structure make this theme highly versatile, and it is a solid starting point for anyone interested in building a profitable blog or online magazine. 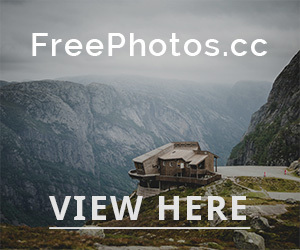 Animated image overlays on featured image thumbnails create a subtle elegance, and proper padding and alignment throughout give the theme ample breathing room. Even for a site with a lot of content, Grimag doesn’t feel cluttered or busy. Each module is give appropriate space, and the eye naturally hones in on ad units dispersed throughout the pages.